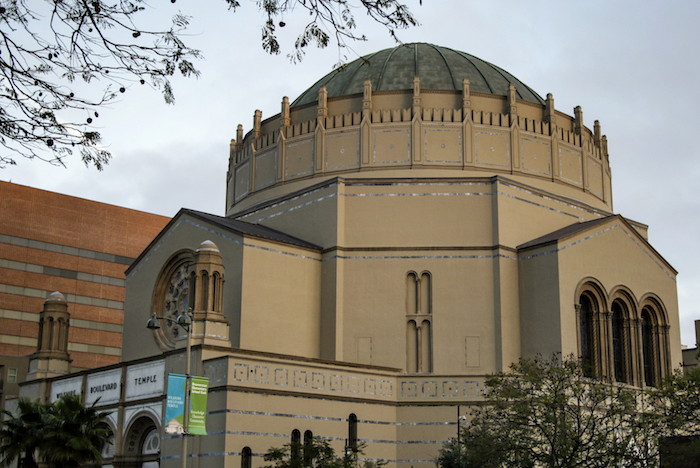 WBT’s long history of responding to the needs of the city’s Jewish community began with its founding in 1862 as Congregation B’nai B’rith, the first synagogue in Los Angeles. The Karsh Family Social Service Center is a permanent and tangible expression of the Temple’s legacy and commitment to community service; it reflects our 150 years of cultural and civic leadership in L.A. The Karsh Center is located in what is now known as L.A.’s Koreatown neighborhood, which Wilshire Boulevard Temple has called home since 1929. Our neighborhood is among the most ethnically diverse and fascinating in the western United States. It is also an area in which many of the residents have intense and culturally diverse needs. “The mission of the Jewish people,” Elie Wiesel wrote, “has never been to make the world more Jewish, but to make it more human.” If being a Jew means caring about other people, there is no better place to be west of New York than Wilshire Boulevard Temple and the Karsh Center. The Karsh Family Social Service Center is headquartered in a beautiful 7,500-square-foot facility along 6th Street on the historic Erika J. Glazer Family Campus at Wilshire Boulevard Temple. Named in honor of longtime Temple members, the Karsh Center is designed to meet the needs of local residents by offering an array of cross-sector, integrated, and co-located social services. Our dream is that the Karsh Center will continue to serve as much more than a hub for on-site social services. The Center provides a catalyst for Temple members—from the children attending our schools and camps to the seniors seeking ways to make a difference—to find their place in the many meaningful community-service initiatives spearheaded by the Karsh Center and WBT. Bikes-for-Tykes, Jews with Tools, and The Big Give are just a few of the existing community programs that started out as smart ideas and grew to become programs that make a difference for thousands of people in need. Do you have an idea? The Karsh Center can help bring it to life by connecting you with like-minded volunteers and social service organizations. Faith-based organizations have long provided social services. Wilshire Boulevard Temple created the Karsh Family Social Service Center as its investment and commitment to its neighbors in Koreatown. The Karsh Center aims to advance the level of neighborhood support, creating a model for the 21st century. By integrating and coordinating a variety of services, the Center will maintain a platform for providers wishing to foster the highest level of care and case management for individual clients. Wilshire Boulevard Temple and local organizations work together—through the Karsh Center— to offer comprehensive resources to the surrounding community in an easily accessible and culturally appropriate manner. The Center strives to meet the needs of all clients, regardless of ethnicity or religion, and help them achieve success in their lives, building stronger families and a stronger community in the process. 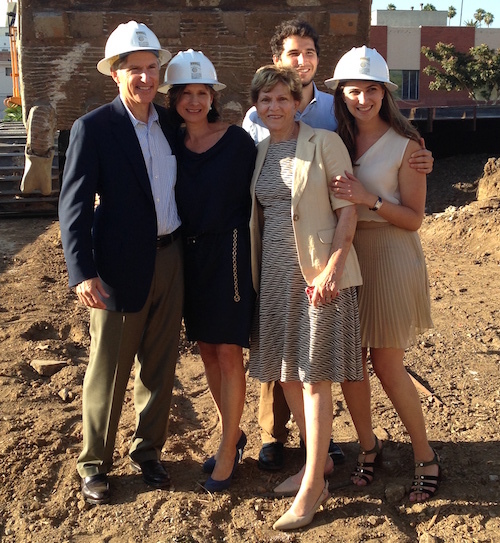 The Karsh family—including daughter Katie, sons Michael and Jeffrey, and Jeffrey’s wife, Jacki—are especially proud of the Center’s Dr. Donald R. Lubin Eye Care Clinic. In 2013, while architectural plans for the Center were in development, Martha’s father, an eye doctor for more than half a century, passed away at age 88. To honor his memory, Katie came up with the idea of endowing a clinic in his name. The family embraced her vision, adding generously to their original gift to endow the Dr. Donald R. Lubin Eye Care Clinic. Martha’s mother, Sybil Lubin, made a significant gift to support the eye care clinic in honor of her husband of almost 60 years. Wilshire Boulevard opens a Sunday Food Pantry to respond to the growing hunger crisis in the Mid-City neighborhood. 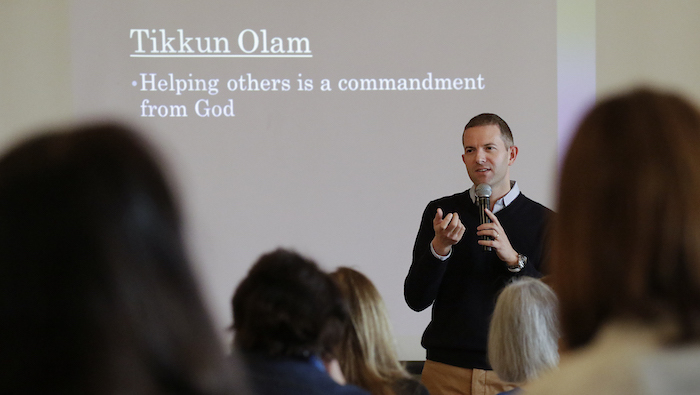 Master planning for the Glazer Campus begins and a “Tikkun Olam Center” is included. The idea being to expand upon the existing Food Pantry and provide additional services to clients. Martha and Bruce Karsh make a pledge to name the “Tikkun Olam Center” The Karsh Family Social Service Center. To celebrate the 20th Anniversary of the Food Pantry, Wilshire Boulevard Temple launched The Big Give, a Thanksgiving meal distribution to feed 1,000 individuals. Rabbi Shapiro begins to conceptualize what a co-located, integrated social service center on the Glazer Campus might look like. He engages in conversations with social service providers across Los Angeles and starts to think about potential collaborators. Rabbi Shapiro meets with Erin Pak of the KHEIR Clinic and begins to consider the possibility of KHEIR providing dental and vision care at Karsh. Rabbi Shapiro meets with David Lash, a long time Temple member and Managing Counsel for Pro Bono and Public Interest Services at O’Melveny & Myers, and begins to conceptualize the pro bono legal services program at Karsh. With the help of David Lash, pro bono legal clinics are formed with all six of the future Karsh Center collaborators, using talented attorneys who are members of Wilshire Boulevard Temple to serve clients in need. Michael and Irene Ross Endowment grant through the Jewish Community Foundation received. Liz Ross begins as the founding Director of the Karsh Family Social Service Center. Erwin Rautenberg Foundation grant through the Jewish Community Foundation received. Stephanie Bressler begins as the Associate Director of Volunteer Engagement of the Karsh Center. Karsh Center opens to clients with Food Pantry, Dental, Vision, and pro bono legal services. Frances Nova begins as the Associate Director of Operations of the Karsh Center. Stephanie Bressler transitions to the role of Director of Development, through a generous grant from the W.M. Keck Foundation. The Mobile Food Pantry launches at the Menlo Apartments. Lila Guirguis begins as the Director of the Karsh Family Social Service Center. Elizabeth Green begins as Associate Director of Volunteer Engagement at the Karsh Center.